Эрнст Удет известен как второй по результативности германский ас Первой мировой войны. В октябре 1922 года он основал фирму "Udet-Flugzeugbau GmbH" для постройки легких аэропланов, разработанных Гансом Херрманом. Пять месяцев спустя в воздух ДальшеMore>>> поднялся первый самолет компании - легкий моноплан Udet U 1, оснащенный 30-сильным (22 кВт) двигателем. Он послужил прототипом для первого серийного самолета компании (построено семь машин) - усовершенствованного U 2, на котором был установлен ПД Siemens мощностью 55 л. с. (41 кВт). Самолеты U 3 и U 4 являлись его двухместным и одноместным вариантами, соответственно. 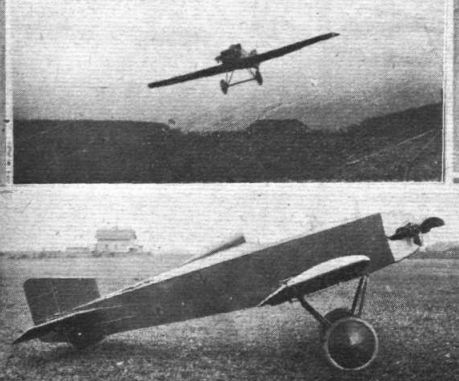 WHEN it was announced that, subject to certain limitations in engine power, Germany would become free to construct aircraft again, we expressed the opinion that probably the regulations would result in a considerable increase in the aerodynamical efficiency of German machines, and that quite a crop of new small machines would be produced. We have recently described several such, and this week we are in a position to give particulars of yet another small single-seater, this time produced by a firm which has but recently been formed. The firm, which has its headquarters in Munich, is known as the Udet Aircraft Works, and was founded by Capt. D. Udet, who was a well-known German air-fighter during the War. Incidentally, the new Udet sporting monoplane is, as far as we are aware, the first post-War machine to be designed and built in Bavaria. 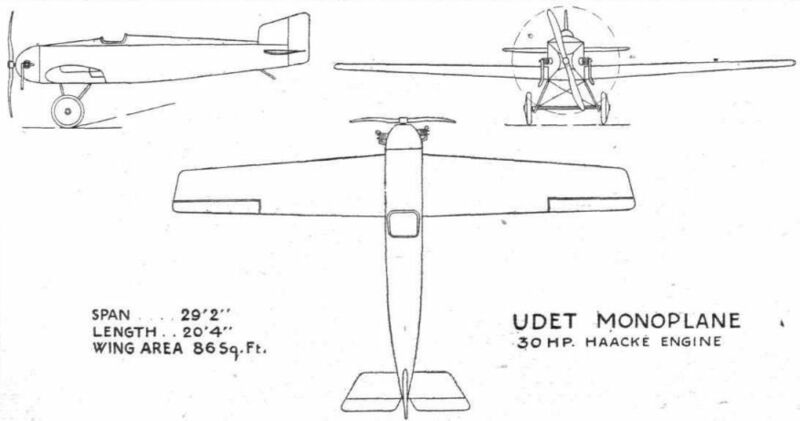 The Udet monoplane was designed by Capt. Udet's technical assistants, Hans Herrmann and A. R. Weyl, and is, as will be seen from the accompanying illustrations, of the cantilever type, with the wing placed low as in the Junkers machines. The machine is characterised by having wings of the, for a cantilever type, unusually high aspect ratio of about 9 to 1. Usually, a much lower ratio is employed for wings of this type in order to keep down the stresses. There is little doubt, however, that the higher aspect ratio results in a considerable improvement in efficiency, as well as in making the machine a good deal nicer to handle, and from the fact that the weight empty of the whole machine is only 440 lbs., the wings cannot be excessively heavy. In the construction of the Udet monoplane wood has been largely employed, especially in the form of three-ply, with the exception of the engine mounting, controls and undercarriage. The wing is built up in one piece, of three-ply ribs, on two box spars having spruce flanges and three-ply sides. One of our photographs gives an idea of the general construction. The area of the wing is only 86 sq. ft., and as the weight of the machine, fully loaded, is 640 lbs., the wing loading is 7.44 lbs. per sq. ft. We have no information relating to the wing section used, nor to the landing speed of the machine, but it is stated that, owing to the good shape of the wing, the machine would easily carry a passenger, with the same small engine. With regard to the structural strength of the wing, we are informed that the factor of safety is everywhere larger than 7; in the case of the front spar it is even stated to be over 10. The designers have worked to such high factors of safety that, even in the hands of comparatively inexperienced private owners, it would be difficult., not to say impossible, so to manoeuvre the machine as to cause breakage in the air. Ailerons of large aspect ratio, although of small area, are hinged to the rear spar. When in place on the machine, the wing spars rest in a recess in the bottom of the fuselage, the lower longerons of which are suitably strengthened to receive them, and are held in place by eight large bolts. It appears that to remove the wing from the machine it is necessary to remove the undercarriage, but as there is no bracing between the rear legs, and the struts are anchored by easily detachable ball-and-socket joints, the operation should not occupy many minutes. When removed, the wing is placed on special trestles above the fuselage, and the machine can, it is stated, be towed by placing the tail skid on the carrier of an ordinary motor-cycle. In fact, the machine was recently thus transported through the streets of Munich, much to the amusement of the passers-by. The fuselage, which is of rectangular section with a slightly curved deck, is covered with three-ply, so that no wire bracing is employed. An exception is the front portion, which carries the 30 h.p. Haacke engine. This part of the fuselage is built up of steel tubes, and is so arranged that the whole engine can be moved a few inches in a fore-and-aft direction for purposes of trimming. As the weight of the engine is only about 140 lbs., however, it is hardly to be expected that a movement of a couple of inches can have any noticeable effect on the trim of the machine. The pilot's seat, it will be seen, is placed relatively far aft, in view of the light engine, and as a matter of fact we understand that in the next machine it will be moved farther forward. For the two-seater in contemplation, the present location will be retained. The controls are of the usual type, and do not call for any comment. The petrol tank is carried in the upper portion of the fuselage, behind the fireproof bulkhead, and it is claimed that sufficient head can be maintained for direct gravity petrol feed. Normally, sufficient fuel is carried for 2 1/2 hours' flight at full throttle, but if it is desired to make longer flights extra tanks can easily be fitted. The undercarriage is of usual V-type, with struts of streamline steel tube, attached to the fuselage by ball-and-socket joints and having cross bracing in the front bay only. The wheel track is only 4 ft. 10 ins. A peculiarity of the design is the position of the undercarriage. From the side elevation it will be seen that the wheels are unusually far back, and one would imagine that the machine might have a tendency to stand on its nose. Probably, when the pilot's seat is shifted forward, the undercarriage will be moved forward also. Beyond stating that they are of the cantilever type, the tail surfaces call for no comment, except to point out that the tail plane appears to be negatively cambered, as in some of the Pfalz machines of the War period. During recent test flights, the Udet monoplane, piloted by Capt. Udet, is stated to have behaved very well, although certain modifications are still necessary before putting it into production. When these have been effected the machine should appeal to many on account of its low running cost. It might be mentioned here that for many months now there has been in existence in this country a small monoplane on very similar lines to those of the Udet. This is a Bristol machine, with the fuselage of the Bristol "Babe," fitted with cantilever wings placed low on the body. This machine has one of the 60 le Rhone engines, but has not yet, we believe, been flown. Engine, 30-40h.p. Haacke (2-cylinder opposed air-cooled); length, o.a., 20 ft. 4 ins. ; span, 29 ft. 2 ins. ; maximum chord, 4 ft.; minimum chord, 2 ft. 7 ins. ; wing area, 86 sq. ft.; height, 5 ft. 7 ins. ; weight of machine empty, 440 lbs. ; weight fully loaded, 640 lbs. ; power loading, 16 lbs./h.p. ; wing loading, 7-44 lbs./sq. ft.; maximum speed, 180 kms. (110 miles) per hour; climb to 3,300 ft. in six minutes; duration with standard tanks, 2 1/2 hours. IN our issue of July 13, 1922, we published illustrations and a description of the Udet sporting single-seater monoplane built by the Udet Aircraft Works of Munich. Since then, that firm has been experimenting with a development of the original experimental machine, and the result is that a two-seater, similar in general appearance to the first machine, has been developed to the point where the designers feel that they can standardise it for quantity production. This is now being done, and as the machine provides a very good example of what can be done with an engine of low power, we have thought that a brief reference to it may be of interest to readers of FLIGHT, more especially in view of the recent production by the Bristol Aeroplane Co. of the 18 h.p. "Cherub" engine described and illustrated in this issue. 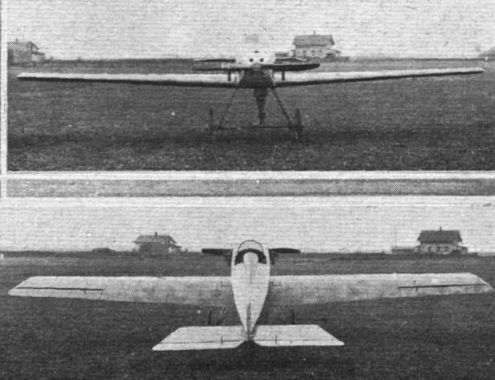 From the accompanying scale drawings it will be seen that the Udet monoplane, in spite of the fact that it has a cantilever wing, is of high aspect ratio. This, coupled with the clean lines of the machine, is no doubt mainly responsible for the general efficiency, and although personally we are of the opinion that the wing loading is too high for a machine of this type, there is no doubt that the top speed is uncommonly good for such a low-power engine. The makers state that the maximum speed is about 150-155 km./hr. (93-96 m.p.h.). As the wing loading is about 9-5 lbs./sq. ft., the landing speed is probably high. No figures are supplied by the makers, but a rough estimate indicates that the minimum speed cannot be much less than 50 m.p.h. That in itself, is not a high figure for the ordinary aeroplane, but as a machine of this type is probably not intended to be used by experienced pilots only, a reduction in the landing speed of 10 m.p.h. or so would, we think, have done no harm. However, this is mainly a question of personal opinion, and if a good top speed is desired, a fairly high landing speed is unavoidable. Constructionally, the Udet two-seater is similar to the single-seater, i.e., the fuselage is a flat-sided plywood-covered structure, while the wings are built up on two box spars having spruce flanges and three-ply sides. The choice of low wing position has doubtless been made mainly on account of a desire to keep the wing in one piece. 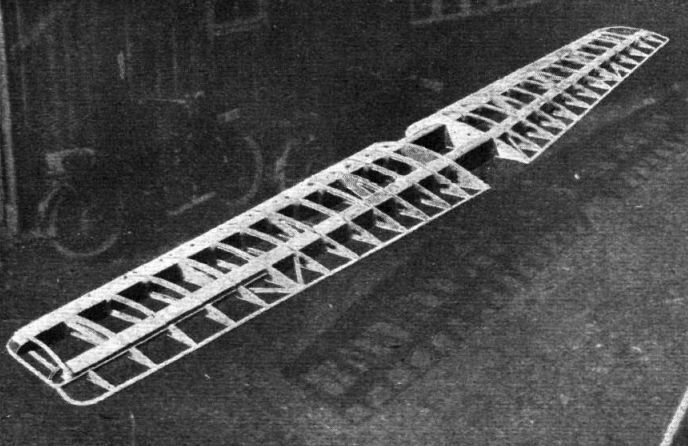 With the wing placed above the fuselage this would have been difficult, as the placing of the cockpits would interfere with the attachment of the rear spar. Aerodynamically, this wing position is generally thought to be slightly inferior to the parasol or wing-on-top-of-the-body type: There is no doubt, however, that both structurally and as regards good visibility for the pilot, the present arrangement has much to recommend it. Another advantage of the low wing is that it becomes easier, without going to a very wide wheel track, to provide against the machine turning over on to its side. In the case of the Udet it is stated that the machine can heel over until a wing tip touches, and the only result is that the wing throws it on to its undercarriage without damage to the wing itself. The attachment of the wing to the fuselage is interesting, and is somewhat similar to that employed by Fokker in the case of some of his biplanes and triplanes, i.e., the spars rest in a cut-out portion and are located by four bolts. As the longitudinal members of the fuselage rest direct on the wing spars, the four bolts do not have to support the load, as would be the case were the wing placed above, but merely to serve to locate the wing. In order to remove the wing the fuselage is placed on two trestles. The rear undercarriage struts are detached, and the undercarriage swung forward, when the four wing bolts can be got at and the plane dropped out of its notch. For purposes of transport, the wing is placed above the fuselage on two special trestles provided for the purpose. The two-cylinder Haacke engine is neatly mounted in the nose of the machine, and is cowled-in all but the outer portion of the cylinders. The petrol tank is placed between the pilot and the fireproof engine bulkhead, and it is stated that there is sufficient "head" to provide direct gravity feed. Incidentally, if we may offer a small criticism of the Bristol "Cherub," it would appear that a better placing of the carburettor might have been below the engine instead of on top of it. In this way gravity feed would have been facilitated. However, if found desirable, this little alteration can probably be easily made. The normal speed of the Haacke engine is 1,400 r.p.m., but the Udet will fly level with the engine throttled down to about 950 r.p.m. The machine is said to be very manoeuvrable, without being too sensitive on the controls, and we understand that it has been found particularly easy to fly, pilots who have not flown since the War having tried it and found no difficulty at all in handling it. The run required for getting off is given as 45 meters (about 50 yards), and the landing run is about 40 yards, the undercarriage being rather high and affording a large angle of incidence when the tail is on the ground. 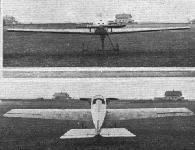 The main particulars of the Udet two-seater sporting monoplane are as follows: Length, o.a., 5-53 m. (18 ft. 2 ins. ); span, 8-9 m. (29 ft. 2 ins. ); height, 2-1 m. (6 ft. 10 ins. ); wing area, 8-8 sq. m. (95 sq. ft.); weight empty, 230 kgs. (506 lbs. ); useful load, 400 lbs. ; total loaded weight, 906 lbs. ; wing; loading, 9-5 lbs./sq. ft.; power loading, 26 lbs./h.p. ; maximum speed, 150 km. (93 miles) per hour; climb to 1,000 m. (3,300 ft.) in 8 mins. ; normal range, 500 km. (310 miles). THE UDET SPORTING SINGLE-SEATER: Three-quarter front view. THE UDET SPORTING SINGLE-SEATER: Three-quarter rear view. The Udet Sporting Single-seater: View of the wing in skeleton.